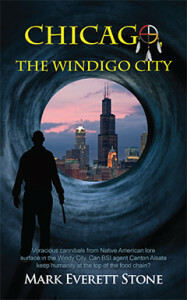 Chicago, The Windigo City ($14.95, 288 pages, ISBN: 978-1-60381-929-9), is Book 4 of Mark Everett Stone’s popular urban fantasy series featuring a super-agent employed by the Bureau of Supernatural Investigation. Next up: Omaha Stakes. “Chicago, The Windigo City is jam packed with action but the heart of the story is Kal’s love and concern for his girlfriend and his best friend …. An original and refreshing tale that leaves me wanting to know more about Kal, Jeanie, BB, and Canton. I look forward to reading the other books in the series.” Read more …. “Kal himself has grown considerably over the last 3 books, where has had defeated many nefarious plans to destroy humanity. This book, although still a novel from the BSI files and still involving Kal, brings to the forefront one of the series strongest supporting characters, Canton Asate, Kal’s best friend…. The book is split almost into two sections, the first is almost a getting to know everyone with lots of character-building which makes these characters more realistic as we get to find out more of their motivations for doing what they do. The second part is the actual case that Canton and Jeanie are working to solve, this doesn’t mean that the pace of the story ever feels like it slows…. I am looking forward to seeing where Mark Everett Stone will take these characters in future novels as the stories along with the characters have gone from strength to strength and I hope that this continues.” Read more …. Books in Motion has issued audiobooks of Mark’s first two BSI novels, Things to Do in Denver When You’re Un-Dead and What Happens in Vegas, Dies in Vegas. Mark’s first novel, Things to Do in Denver, won the second place Forward Literature Award for Humor and was one of seven titles nominated for ForeWord Magazine’s debut fiction award, ForeWord Firsts. The Judas Line was a finalist in ForeWord’s Book of the Year Awards and earned a starred review in Publishers Weekly. Kal Hakala is the Bureau of Supernatural Investigation’s best agent, but even he needs a break after his last case, which brought him a hair’s breadth from death and killed the fiancée of his best friend, a Mescalero Apache agent named Canton Asate. Kal’s temporary desk-job is nothing less than leadership of the entire BSI. Now it is on his head to assemble teams of agents to fight the latest Supernatural incursions and man up if they fail. Windigo spirits in Chicago are possessing human beings and transforming them into ravenous cannibals. Canton is the natural choice for a team leader because of his knowledge of Native American lore. Is Canton, a legend with a knife, ready to strike again, so soon after his fiancée’s death? What about Kal’s own girlfriend, Jeanie? Can he stand to put her in danger and beyond his protection? Kal is forced to use the BSI’s cutting-edge virtual reality system to see what makes them both tick. Will the experience of virtually living their lives afford him the will to send those he loves into danger? Can an emotionally damaged man who has never led a team and a woman who traveled through time from the 1940s make the cut? For Kal, the choice isn’t easy, but for Canton and Jeanie, it could be deadly. Born in Helsinki, Finland, Mark Everett Stone arrived in the U.S. at a young age and promptly dove into the world of the fantastic. Starting at age seven with the Iliad and the Odyssey, he went on to consume every scrap of Norse Mythology he could get his grubby little paws on. At age thirteen he graduated to Tolkien and Heinlein, building up a book collection that soon rivaled the local public library’s. In college Mark majored in Journalism and minored in English. Mark lives in Denver with his wife, Brandie, and their two sons, Aeden and Gabriel. Click here to find him on the Web. Using the rectangular lens (dubbed a MagniGlass by Special Branch) I kept an eye on the three newcomers. The two cops were talking to the Fed cop with plenty of animated gesticulating and head bobbing. It looked intense, intense enough that I was able to walk a block, cross the railroad tracks and get within a few yards before the Fed caught sight of me. “Stop right here!” he warned, hand moving to the weapon holstered under his suit jacket. I smirked, replaced my wallet, and gave him a good hard look. Up close he was even better looking than I thought. Expensive salon cut hair to go along with his hideously expensive suit, which he wore far too well. A superior air coated his features like thick makeup. I’d known guys like that in high school, idiots who used to call me derogatory names because of my race. Perhaps he was different, but I wasn’t going to place any bets. I held out a hand. “I showed you mine; now show me yours.” My smile wasn’t seconded by my voice, which carried a definite edge. Alpha dogs sniffing each other, right? “Who the hell is Manny Garces, Boss?” Jacobs sent. Gotta love the Bureau, we have all the coolest toys and access to all the Alphabet Agencies. “Why wasn’t the FBI informed?” Ng didn’t sound angry and by the look of it, he could teach rocks about inscrutability, but there was the slightest edge to his voice that spoke of great restraint. “It’s what I’m doing now, isn’t it? The question is, what are you three doing out here in the middle of the night?” That’s what really fried my bacon. Why wouldn’t they meet in a nice office somewhere? I swiveled my head in time to see an indigent—a short, stubby man with a graying, bushy beard and filthy clothes—walk toward us along the tracks. A bottle encased in a paper bag was clenched in one grimy fist and I could see, thanks to the nightvision, that his lips were parted in a smile of glee or madness. The rest of his face was obscured by a battered and grimy Cubs hat. Hmph … the Cubs. No accounting for taste. “I done seen what shouldn’t be seen,” the bum crooned, his teeth surprisingly white. “I seen what no one should seen.” He gave an odd little twirl as he moved closer. His black Converse sneakers were torn and tattered to the point I could see his long, black toenails and the weeping sores on his feet. And the suddenly the bum was there, in Beinfort’s face, teeth flashing, mouth opening impossibly wide and arms, freakishly long arms, arms that extended so much farther than the sleeves on his filthy jacket, wrapped around the Lieutenant and there was a crunch and a slurping sound that reminded me of inhaling soup from a spoon and Beinfort screamed long and loud, a wail filled with anguish and rage. Blood, slick and black in my nightvision, sprayed into the air, an arterial spurt that coated the gobbling bum in coppery fluid.